The answer? As soon as their first teeth come through. Public Health England recommend that your child should be seen from the age of six months, which is when their first teeth start coming through. NHS dental treatment for children under the age of 18 is FREE OF CHARGE so it’s the perfect time to bring them along. Why should my child be seen by the age of one? Tooth decay is the most common oral disease affecting children with a quarter of 5-year-olds having decay in 3 or 4 teeth. 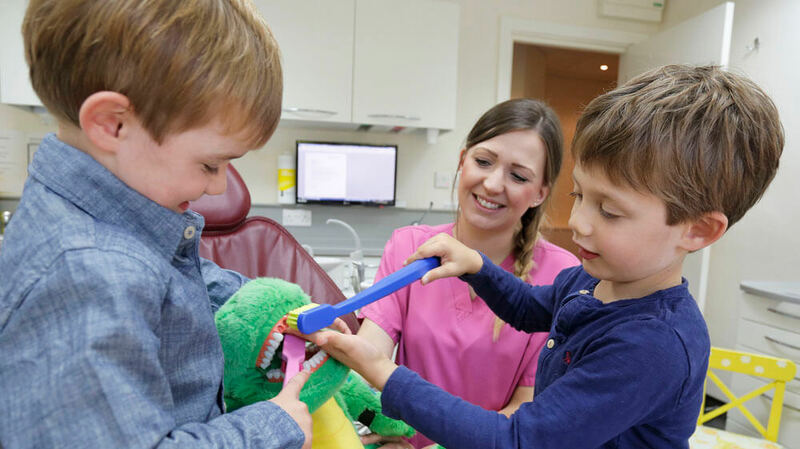 It Is largely preventable – bringing your children to the dentist from an early age allows your dentist to check everything is developing normally and identify any early problems. Will they be a bit young for a dental check up? Our friendly team are trained to help examine even the youngest of children. We can examine your child in your lap or on your knee to help them feel more comfortable. Sometimes, it doesn’t always work out and even with distractions, games and the best will in the world we can’t get a look in your little one’s mouth. Don’t worry – we can try again next time! Getting your child to attend from an early age helps them to become more familiar with the dentist and the environment. It also allows our dental team to check you’re using the right toothpaste and offer any advice on teething or brushing. We can also help with dietary and weaning advice which can be beneficial for your child as their teeth develop and to help reduce the risk of tooth decay. For more information, visit: https://www.bspd.co.uk/Patients/Dental-Check-by-One or give us a call on 0115 9254169.